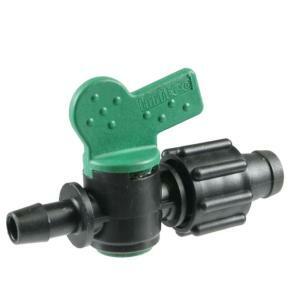 These Perma-Loc tape barbed take-off adapter valves are designed to connect 5/8” drip tape to poly tubing where on/off functionality is needed using a barbed takeoff. Use the 3.6mm barb to connect 5/8" drip tape to any 1/2", 3/4”, 1”, or larger mainline poly tubing with shorter runs of tape and the 7.0mm barb to connect 5/8" drip tape to any 3/4”, 1”, or larger mainline poly tubing for high flow and long runs of tape. (Due to restrictions produced in the line, the 7.0mm barb is not recommended for use with 1/2” Poly Tubing). The barbed takeoff adapter w/valve, allows the user to run a line of drip tape from the poly tube mainline. After laying out your mainline tubing at the head of the area you want to water, use the appropriate punch tool to make a hole in the mainline where you want each line of drip tape located. Insert the barbed end of the takeoff adapter w/valve into the poly tube and attach the tape to the other end of the Takeoff Adapter, w/valve, per the instructions below. Please Note: Small 3.6mm barb is not compatible with 1/4" micro-tubing.